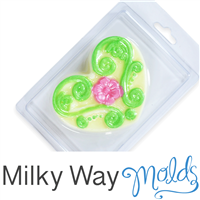 Milky Way Soap Molds can tolerate temperatures of 135-145 degrees F. Above these temperatures, warping may occur. 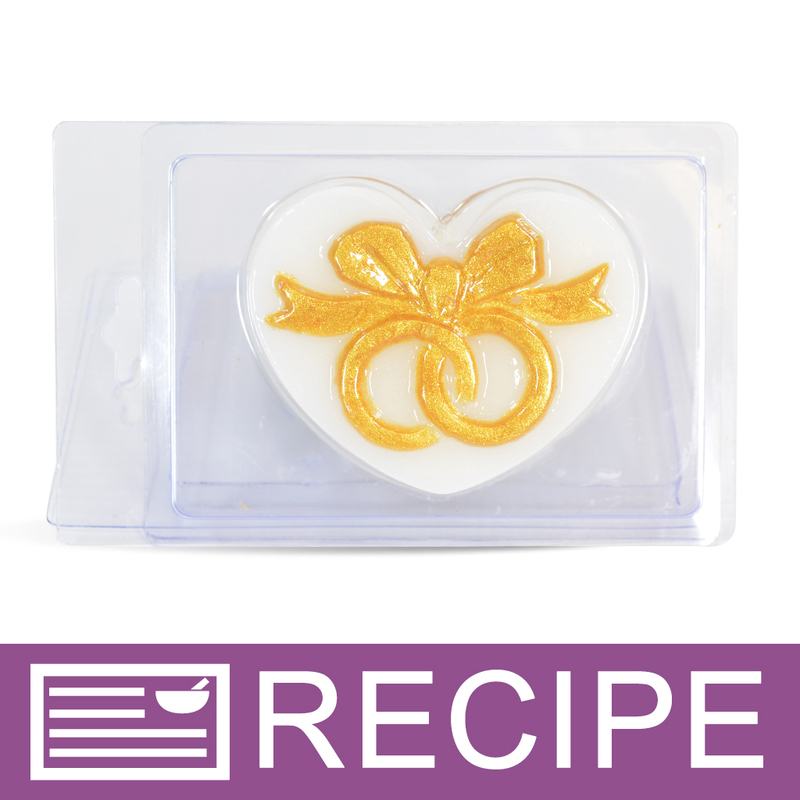 Maximum pour temperature: 135º F.
Pour soap/lotion bar base into mold and let harden. Let cool and harden before closing. When used for CP Soap, we recommend leaving the hinge open for 4-6 weeks until soap is cured. "Nice for gift bags for wedding party." COMMENTS: Super cute clamshells, can't wait to try them! 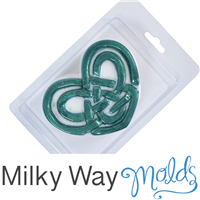 COMMENTS: love how easy this mold releases and the ease in packaging, you just snap on the back and sell as is. COMMENTS: These are super cute! COMMENTS: These look great, but they're a little bit of a pain to fill in the ring and ribbon with a dropper. Otherwise, they are excellent for wedding and bridal favors! COMMENTS: Just received these and can't wait to use them. They will make excellent bridal shower gifts, wedding reception gifts, and anniversary gifts. 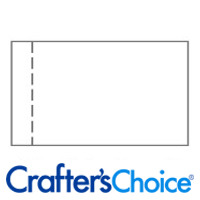 "Great product for large orders for wedding gifts!" COMMENTS: I love love love these plastic clamshells! If you have a large order, these will cut your production time in half! If you have a large enough workspace and a large glass Pyrex bowl, you can easily make 20 soaps at a time! While the soaps are hardening, you can design and print out your product labels and put them on the backs. As soon as the soaps harden, I put the lids on and pack them so I can ship them. Just a note: If you are shipping a quantity that requires multiple layers/stacking, place 2 layers of thin bubble wrap or 1 layer of thick bubble wrap between the layers. Also, before you quote your customers a shipping price, do your research for exactly how much it will cost you to ship say, 20, 40, 60 and so on. Research different shipping methods to make sure you get the best price for you AND your customers! COMMENTS: These just came in and are already a work in progress. I had customers waiting on these for wedding shower parties. This is a beautiful design and makes a very attractive soap. Perfect for gifting and showers. Also I REALLY like working with clamshells. I had one order of 25 of these, and the clamshells make it quicker and easier to work in quantities. I also love the smaller size of this soap. "Wedding Rings Clamshell using MP"
COMMENTS: I have used the clam shells for wedding favors and also as lotion bar containers. I loved them both and will definitely use them again. COMMENTS: I am adding these to my wedding favor line. Pretty wedding soap molds are hard to find. These are classy and timeless. I plan to make them for my best friends wedding soon! You don't even have to make them over fancy, just a few colors, and they fill in easily! COMMENTS: I bought this to try and it works amazing. I use eye droppers to fill in the rings and the mold was made perfectly. Married couples love this. 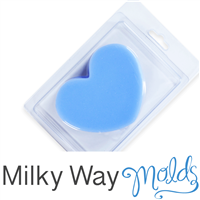 "Hi, are the dimensions provided for the actual heart inside or the entire mold? Thank you!" Staff Answer Dimensions for the entire mold area are provided under Additional Information for this product.